The 21-foot Safe Boat is a rugged center console used by the anglers of the National Geographic Channel show "Shark Men." And it’s designed to take a beating and keep its crew safe. A hard polyethylene foam collar surrounds the aluminum hull, and handrails are scattered about. (There are five on the console.) The 10-inch aluminum cleats look as if they belong on a tugboat, and the non-skid that covers the deck and the gunwales — rectangular patches of 3M&apos;s Safety-Walk Coarse Tread — is the most aggressive I&apos;ve seen. "They can step up or sideways or any way without having any sort of a slip," says Kevin Rowlee, sales manager for Safe Boats, based in Bremerton, Wash.
During a recent Yamaha engine-testing event I got a chance to drive the Safe Boat. I ran it with Shark Man Denny Wagner, who threw the boat into 40-mph donuts to show its tracking and maneuverability. "You&apos;ll lose your crew before you flip this thing," he says. Click play to watch Wagner demonstrate the capabilities of the Safe Boat. Wagner is a member of Ocearch, a non-profit that catches and releases large marine species, such as the great white shark, for research. The Shark Men use the Safe Boat — and a 23-foot Contender — to hook and haul their catches to a 126-foot research vessel for data collection. Previous small boats have failed to survive the hard use in rough conditions. "We&apos;ve had the ship at anchor and large swells rolling through and have had boats get pinned under the ship, with the transom crushing them," Wagner says. 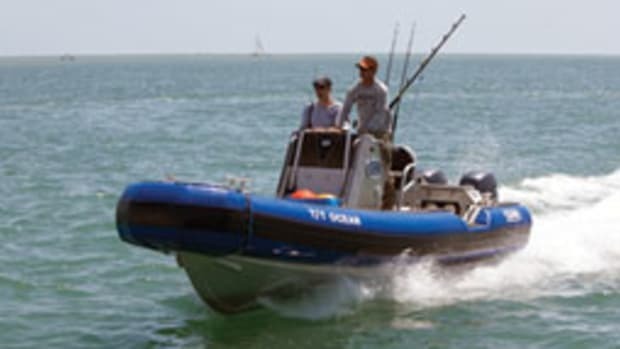 Safe Boats builds military, law enforcement and research vessels, but it also offers several models for recreational use, including the center console. "An owner may have one to get to a house on an island, or they are utilized as a tender for a megayacht," Rowlee says. With twin Yamaha F115s, the 21 tops out at 44 knots, with a cruise of 37 knots. Price: $130,000. Contact: Safe Boats.